Three remarkable female leaders took the stage at the sold-out Women of Influence Breakfast Presentation on November 14. Hosted by Edwards Executive Education, the 16th annual event celebrated authentic leadership, inspiring role models, and accomplished citizens. 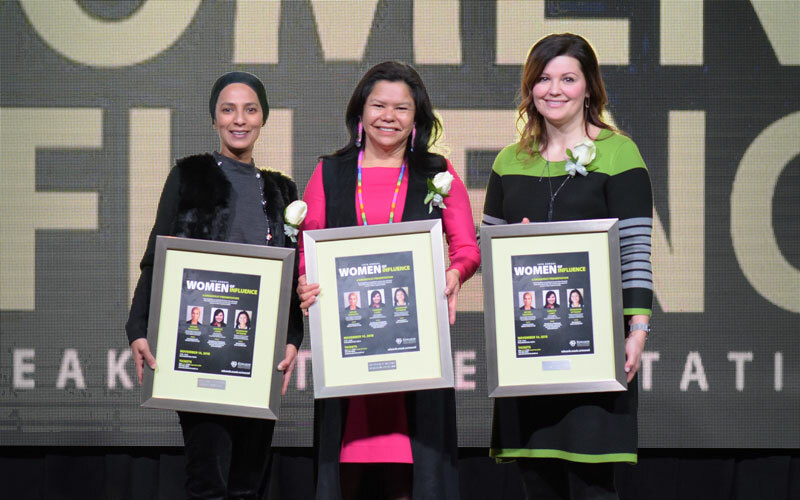 The three 2018 Women of Influence each shared candid stories of success in their respective fields. The breakfast presentation began with Dr. Jacqueline Ottmann, vice-provost of Indigenous engagement and professor at the University of Saskatchewan. Ottmann, who is Anishinaabe (Saulteaux), has been recognized as an international researcher, advocate, and change-maker. She spoke about Indigeneity and leadership. Drawing from her experience, she discussed how leadership is both an art and a science and addressed the need to weave Indigenous perspectives into education systems. Ottmann emphasized the need to move Truth and Reconciliation forward by encouraging the audience to help close the gap between aspiration and action. Dr. Fatima Coovadia, a human rights commissioner and consultant with the Saskatchewan Human Rights Commission led the next keynote. Originally from South Africa, Coovadia is an ardent advocate for human rights and passionate about citizenship education. Using a kaleidoscope as a metaphor, she shared how a slight shift in perspective can transform change. Incorporating personal stories of the harsh realities of growing up during the South African apartheid, Coovadia emphasized how leadership is one’s own identity, voice, and journey. Embracing the changing nature of the kaleidoscope, she inspired the audience to find their own voice. Candace Laing, vice president of sustainability and stakeholder relations at Nutrien, was the final keynote. Laing’s career has spanned both the public and private sectors, and she is passionate about high-performance cultures, responsible growth of business and sustainable agriculture. She focused her talk on internal barriers to success. Drawing from personal experience navigating the job market, Laing addressed how it is all too easy for women to downsize their aspirations and emphasized that it is okay to love both family and a career. She critically nudged the audience to feel entitled. Laing closed the breakfast presentation by challenging the audience to address their internal barriers to move the needle forward on gender equality. The event also recognized the recipient of the Women of Influence Award, a scholarship intended for business students (male or female) who are making progress towards degree completion and are single-parents of dependent children. Lori Waterhen, a third-year Management major, was selected to receive the scholarship. Thank you to our generous event sponsors for their help in making the 16th Annual Women of Influence Breakfast a success: BDC, Global Saskatoon, ICR Commercial Real Estate, Moxies, Our Best to You Handmade Market, Persephone Theatre, Prairieland Park, Radisson Hotel, Rawlco Radio, Select Roses, TCU Place, Trek 2000 Corporation, U of S Book Store, Vanity Hair and Esthetics, and the YWCA Saskatoon. For future programming opportunities, please visit Edwards Executive Education at: www.edwards.usask.ca/execed.